The adoption of the Common Core State Standards offers an opportunity to make significant improvements to the large-scale statewide student assessments that exist today, and the two US DOE-funded assessment consortia -- the Partnership for the Assessment of Readiness for College and Careers (PARCC) and the SMARTER Balanced Assessment Consortium (SBAC) -- are making big strides forward. But to take full advantage of this opportunity the states must focus squarely on making assessments both fair and accurate. A new report commissioned by the Rennie Center for Education Research & Policy and Policy Analysis for California Education (PACE), The Road Ahead for State Assessments, offers a blueprint for strengthening assessment policy, pointing out how new technologies are opening up new possibilities for fairer, more accurate evaluations of what students know and are able to do. Not all of the promises can yet be delivered, but the report provides a clear set of assessment-policy recommendations. 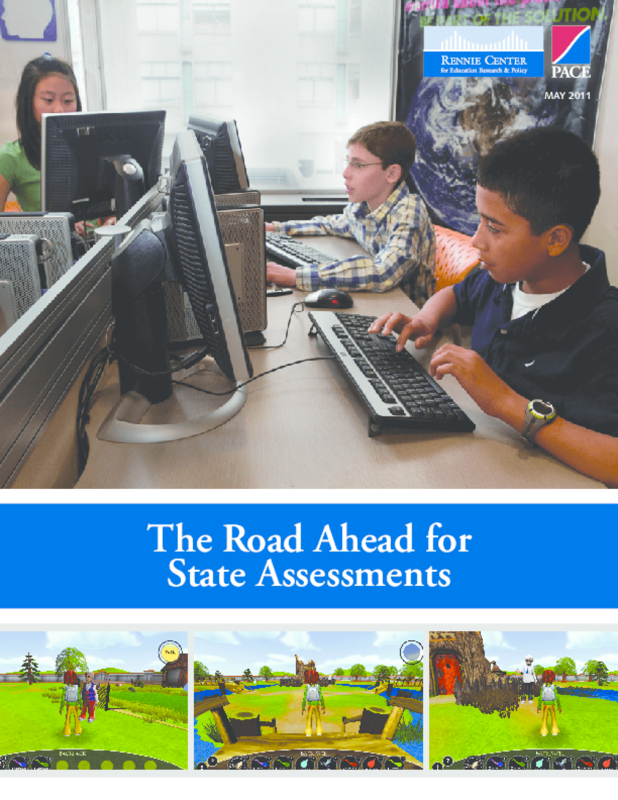 The Road Ahead for State Assessments includes three papers on assessment policy. The first, by Mark Reckase of Michigan State University, provides an overview of computer adaptive assessment. Computer adaptive assessment is an established technology that offers detailed information on where students are on a learning continuum rather than a summary judgment about whether or not they have reached an arbitrary standard of "proficiency" or "readiness." Computer adaptivity will support the fair and accurate assessment of English learners (ELs) and lead to a serious engagement with the multiple dimensions of "readiness" for college and careers. The second and third papers give specific attention to two areas in which we know that current assessments are inadequate: assessments in science and assessments for English learners. In science, paper-and-pencil, multiple choice tests provide only weak and superficial information about students' knowledge and skills -- most specifically about their abilities to think scientifically and actually do science. In their paper, Chris Dede and Jody Clarke-Midura of Harvard University illustrate the potential for richer, more authentic assessments of students' scientific understanding with a case study of a virtual performance assessment now under development at Harvard. With regard to English learners, administering tests in English to students who are learning the language, or to speakers of non-standard dialects, inevitably confounds students' content knowledge with their fluency in Standard English, to the detriment of many students. In his paper, Robert Linquanti of WestEd reviews key problems in the assessment of ELs, and identifies the essential features of an assessment system equipped to provide fair and accurate measures of their academic performance. The report's contributors offer deeply informed recommendations for assessment policy, but three are especially urgent. Build a system that ensures continued development and increased reliance on computer adaptive testing. Computer adaptive assessment provides the essential foundation for a system that can produce fair and accurate measurement of English learners' knowledge and of all students' knowledge and skills in science and other subjects. Developing computer adaptive assessments is a necessary intermediate step toward a system that makes assessment more authentic by tightly linking its tasks and instructional activities and ultimately embedding assessment in instruction. It is vital for both consortia to keep these goals in mind, even in light of current technological and resource constraints. Integrate the development of new assessments with assessments of English language proficiency (ELP). The next generation of ELP assessments should take into consideration an English learners' specific level of proficiency in English. They will need to be based on ELP standards that sufficiently specify the target academic language competencies that English learners need to progress in and gain mastery of the Common Core Standards. One of the report's authors, Robert Linquanti, states: "Acknowledging and overcoming the challenges involved in fairly and accurately assessing ELs is integral and not peripheral to the task of developing an assessment system that serves all students well. Treating the assessment of ELs as a separate problem -- or, worse yet, as one that can be left for later -- calls into question the basic legitimacy of assessment systems that drive high-stakes decisions about students, teachers, and schools." Include virtual performance assessments as part of comprehensive state assessment systems. Virtual performance assessments have considerable promise for measuring students' inquiry and problem-solving skills in science and in other subject areas, because authentic assessment can be closely tied to or even embedded in instruction. The simulation of authentic practices in settings similar to the real world opens the way to assessment of students' deeper learning and their mastery of 21st century skills across the curriculum. We are just setting out on the road toward assessments that ensure fair and accurate measurement of performance for all students, and support for sustained improvements in teaching and learning. Developing assessments that realize these goals will take time, resources and long-term policy commitment. PARCC and SBAC are taking the essential first steps down a long road, and new technologies have begun to illuminate what's possible. This report seeks to keep policymakers' attention focused on the road ahead, to ensure that the choices they make now move us further toward the goal of college and career success for all students. This publication was released at an event on May 16, 2011. Copyright 2011 Policy Analysis for California Education and Rennie Center for Education Research & Policy. All rights reserved.